The warming bias in Australia’s ACORN-SAT maximum dataset is largely due to just two adjustments. Last week’s Report of the Technical Advisory Forum’s review of the ACORN-SAT temperature reconstruction produced some rather bland, motherhood type statements. However, hidden in the public service speak was a distinct message for the Bureau of Meteorology: lift your game. Two of the areas I have been interested in are (a) whether individual adjustments are justified, and (b) the effect of these adjustments on national and regional temperature trends. In this post I look at adjustments at just two sites, which are responsible for the single largest increase in national trend. Fig. 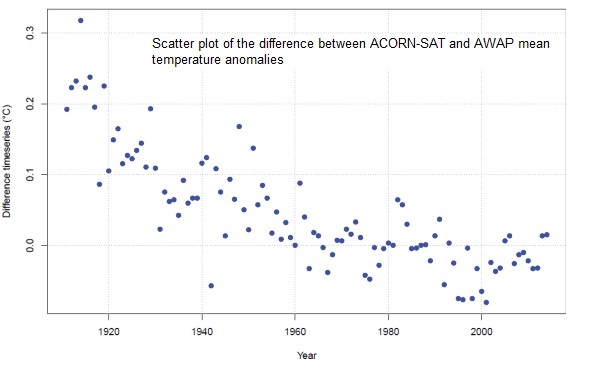 1: Scatterplot of difference between AWAP and Acorn annual mean temperature anomalies. 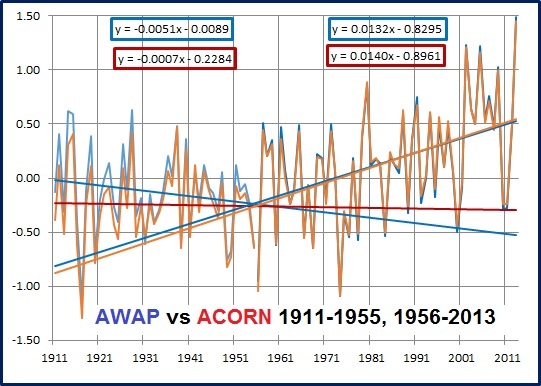 This is a clear statement of how much Acorn adjustments have cooled past temperatures, as AWAP is regarded as being only “partially homogenised”, and close to raw temperatures. There is a considerable difference- more than 0.2 degrees- between the two interpretations of temperatures 100 years ago. Note there is a trend of +0.22 degrees / 100 years in the differences, indicating a predominance of cooling of earlier data; there is a very large range in the first 50 years, from about -0.7C to +0.3C, and one outlier at +0.4C, reducing to a much narrower band in the 1960s before increasing in the last 20 years; and the bulk of differences are negative before 1970. 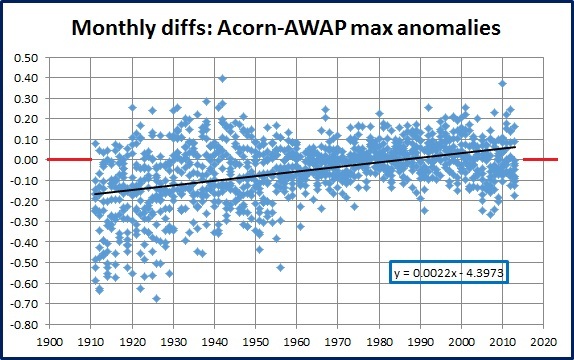 The trend in differences for the first 67 years is 0.33C / 100 years, but there is a very small tendency for Acorn to be cooler than AWAP recently- and the range of differences has been increasing. That’s an interesting find, but I want to examine in more detail the effect of the adjustments which cause those differences. 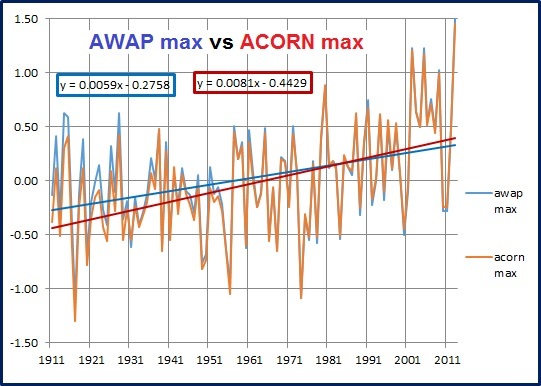 Here are annual maxima in AWAP compared with Acorn. Again we see that Acorn has increased the warming trend from +0.59C to +0.81C per 100 years, an increase of +0.22C, or 37.3%. However, the difference appears more marked before the mid 1950s. The next graph shows the trends from 1911 to 1955 compared with the trends from 1956 to 2013. Fig. 5: Comparison of trends in maxima before and after the middle of the 20th Century. 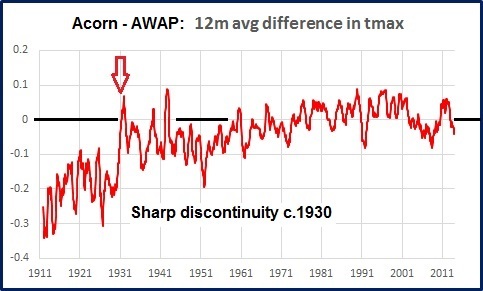 Note: while the trends of AWAP and Acorn are very similar (+1.32 to 1.4C per 100 years) since the 1950s- which the Bureau never tires of proclaiming- before then the plot tells a different story. Acorn reduces the cooling trend by 0.44C per 100 years, a reduction of 86%. 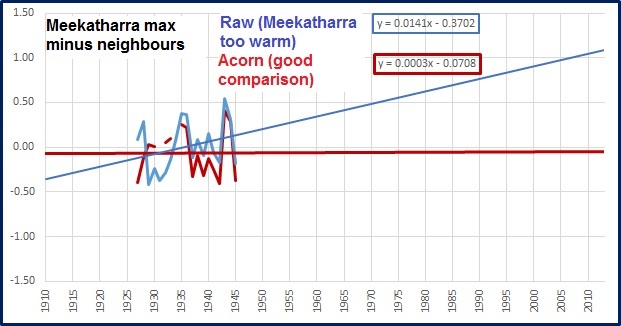 Returning now to maximum temperature, the differences between the AWAP and ACORN analyses show a marked drop in the early 1930s, with a sudden decrease of about 0.15 °C. This is most likely attributable to substantial negative adjustments between 1929 and 1932 in the ACORN-SAT dataset, indicating substantial discontinuities (expressed as artificial cooling) at a number of individual locations with a large influence on national analyses, because of the sparsity of data in their regions in that period. These discontinuities are mostly related to site moves that are associated with concatenated records for single locations. These include Alice Springs, Kalgoorlie and Meekatharra. Alice Springs, where the adjustment is associated with a site move in late 1931 or early 1932 from the Telegraph Station to a climatologically cooler site in the town, has a notably large “footprint”; at that time there were only two other locations within 600 kilometres (Tennant Creek and Charlotte Waters) which were observing temperatures, while the nearest neighbours to the west (Marble Bar and Wiluna) were more than 1200 kilometres away. 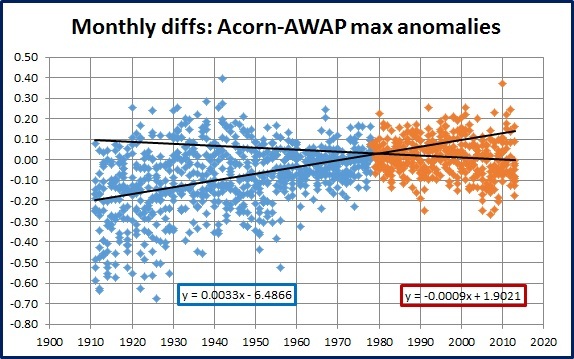 This large change between AWAP and Acorn is shown in the next graph. As I explained in my post in September 2014, Acorn sites are homogenised by an algorithm which references up to 10 neighbouring sites. A test for the validity of the adjustments is to compare the Acorn site’s raw and adjusted data with those of its neighbours, by finding the differences between them. Ideally, a perfect station with perfect neighbours will show zero differences: the average of their differences will be a straight line at zero. Importantly, even if the differences fluctuate, there should be zero trend. Any trend indicates past temperatures appear to be either relatively too warm or too cool at the station being studied. My aim is to check whether or not individual adjustments make the adjusted Acorn dataset compare with neighbours more closely. If so, the trend in differences should be close to zero. I have tested the three sites named above. I use differences in anomalies calculated from the mean of maxima for the 30 year period centred on 1931, or for the period of overlap if the records are shorter. The neighbours are those listed by the Bureau on their Adjustments page. Note that the Acorn adjustment (-0.77C at 1/1/1929- the adjustment of +0.54C at 1/1/1934 does not show up in the national signal) is indeed valid: the resultant trend in differences is close to zero, indicating good comparison with neighbours. However, since Meekatharra’s record starts only in 1927, two years of the Meekatharra adjustment cannot have had a large influence on the national trend as claimed. 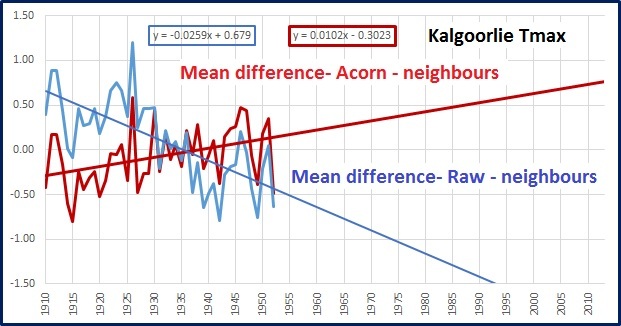 Kalgoorlie’s steep cooling compared with neighbours (from 170 km to 546 km away) has been reversed by the Acorn adjustment (-0.62C at 1/1/1930- the adjustment of -0.54C at 1/12/1936 does not show up in the national signal), so that Kalgoorlie now is warming too much (+1.02C / 100 years more than the neighbours). Kalgoorlie’s adjustment is too great, affecting all previous years. I now turn to Alice Springs, which ‘has a notably large “footprint”’. Too right it does- its impact on the national climate signal is 7% to 10%, according to the 2011 Review Panel, p. 12. 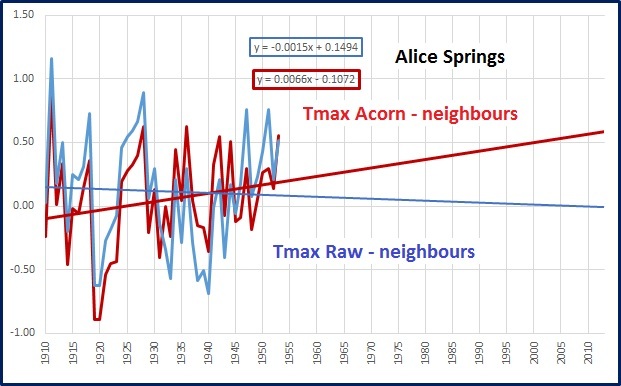 Alice Springs, cooling slightly compared with neighbours, has been adjusted (-0.57C at 1/1/1932) so that the Acorn reconstruction is warming (+0.66C / 100 years) relative to its neighbours. The adjustment is much too large. And exactly where are these neighbours? Tennant Creek (450 km away), Boulia (620 km), Old Halls Creek (880 km), Tibooburra (1030 km), Bourke (1390 km), and Cobar (1460 km)! The site with the largest impact on Australia’s climate signal has been “homogenised” with neighbours from 450 km to 1460 km away- except the adjustment was too great, resulting in the reconstruction warming too much (+0.66C / 100 years) relative to these neighbours. The same applies at Kalgoorlie. Meekatharra’s record only starts in 1927 so its effect can be discounted. These are the only remote Acorn sites that had large adjustments at this time. All other remote Acorn sites open at this time either have similar trends in raw and Acorn or had no adjustments in this period. The 37.3% increase in the trend of Australian maxima anomalies in the “world’s best practice” ACORN-SAT dataset compared with the “raw” AWAP dataset is largely due to just two adjustments- at Kalgoorlie and Alice Springs- and these adjustments are based on comparison with distant neighbours and are demonstrably too great. If it wasn’t so serious it would be laughable. Global Warming Enthusiasts have held the floor for too long. It is time for genuine climate scientists to take the initiative and adopt, address, and promote the concept of Peak Warmth. What exactly is Peak Warmth? The well-known concept of Peak Oil is the point in time when the maximum rate of extraction of petroleum is reached. Peak Warmth is an unrelated but similar concept. Peak Warmth is that point when global temperatures inevitably reach their maximum before beginning to cool. Included in our discussion of the hiatus, pause, slowdown, or plateau in global temperatures, which may be followed by temperatures going up, down, or sideways, we need to consider Peak Warmth, as its consequences could be enormous. The first thing to note of course is that Peak Warmth is well and truly past- in fact, around 5,000 to 8,000 years past. Many studies from around the world show the Holocene Optimum was from one to several degrees Celsius warmer than now, in different regions of the globe. The previous Eemian interglacial appears to have been even warmer. The Holocene has also had periods of millennial-scale variability in temperature and precipitation (think Mediaeval Warm Period, Little Ice Age). In various parts of the world, regional temperature change of four degrees Celsius in a century has not been unusual, so there’s nothing unprecedented about recent warming. However, the focus of this post is the recent warming of the past 160 years. Global Warming Enthusiasts can see no end to the recent warming, at least not without massive cuts to greenhouse gas emissions. They need to be pinned down: what will happen after 2100? Will there be runaway warming? Will temperatures continue to rise, and by how much? Sceptics of the validity of the IPCC’s global warming scenarios have a different view. If the recent temperature increase is mainly due to natural causes, then a decrease at some stage is very likely. Some sceptics will say that natural influences will shortly cause (or have already caused) temperatures to begin cooling. Others (including myself) will say “We don’t know and can’t predict what will happen, or when”. We note, however, that going by the past, future cooling is inevitable- the instrumental record, such as it is, shows short warming phases are followed by cooling. The Dark Ages followed the Roman Warm Period, and the Little Ice Age followed the Mediaeval Warm Period. And while we don’t know the timing or mechanism of glacial inception which could be decades, centuries, or millennia away, we are overdue for the next glaciation. Are there any indications of Peak Warmth? Arguably one of the best temperature datasets is that of the satellite derived UAH (University of Alabama- Huntsville). The Temperature of the Lower Troposphere gives a good indication of what the bulk of the atmosphere is doing. Unfortunately, we only have data since December 1978. During the satellite era, the global temperature record shows 15 years of modest warming, then a rapid increase between the early 1990s and 2001 – 2002. (This period includes but is independent of the 1997-1998 Super El Nino.) The pause is undeniable since then- a bit over 13 years. Actually, it is a small cooling. For the benefit of those who think including the Super El Nino exaggerates the trend of the rapid warming phase, excluding 1997, 1998, and 1999 gives a trend of +1.54C- just 0.07C less. While we can say that current temperature trends are not consistent with IPCC projections, and alternative climate scenarios must be considered, it is too early to say whether we have reached or passed Peak Warmth of the current warm period, or if there will be future warming phases to a higher peak. We won’t know until many years afterwards. It is possible that Peak Warmth will be identified as occurring in a single month or year (for example, April 1998), but it is also possible that it will be seen as a period of some decades or even centuries. I hope I am not around to see the cooling which will follow Peak Warmth. A long plateau at about current temperatures, or even a small decline, would not be detrimental for the world, but unlike Elsa, cold does bother me. While I have great faith in the ability of humankind to adapt to future challenges, another Little Ice Age would have very serious consequences for world food production, and the next glacial period must surely bring an end to civilization as we now know it. It is time for genuine climate scientists to adopt and address the concept of Peak Warmth. The Precautionary Principle, invoked to justify measures to combat or mitigate global warming, needs to be invoked to address the consequences of future global cooling. Myopic denial of the pause wastes time and resources which must be better spent in studying little understood influences on climate such as clouds, rather than the current fixation on greenhouse gases as a cause of warming to the exclusion of all else. What does it take to get action following a formal complaint? I draw your immediate personal attention to this matter. It is now fully 11 weeks since I submitted four simple questions to Dr Vertessy’s office (Reference REF2015-089-17) , nine weeks since my follow up request with a copy to you, and four weeks since I made a formal complaint to you. Sam Hussey-Smith of your office emailed me on Tuesday 19th May, saying he would “seek to get a response as soon as possible”. I may be a mere insignificant individual with a minor query, but surely I deserve to be treated with a little respect, and surely the Bureau of Meteorology, the Environment Department, and the office of its Parliamentary Secretary, all need to demonstrate transparency and public accountability. Perhaps Dr Vertessy hopes I will get sick of waiting and will lose interest, saving him the embarrassment of an apology and a probable retraction. He should not underestimate my determination. The longer he delays, the more it looks as if he has something to hide. I seek your urgent personal intervention to ensure an immediate response. Here is my formal complaint, sent 4 weeks ago (18 May). It is seven weeks since I submitted four questions to Dr Bob Vertessy, Director and C.E.O. of the Bureau of Meteorology, through the Bureau’s feedback channels, and two full weeks since I followed this up with a complaint with a copy to your office. The Bureau acknowledged receipt (ReferenceREF2015-089-17) and an officer of the Bureau has confirmed that my queries were indeed passed on to the Director’s office. However, there has been no other response at all, either from the Bureau or from your own office. Seven weeks, Mr Baldwin, seven weeks! This is beyond simple negligence. It is now in the realm of conscious breach of the Bureau’s own Service Charter for the Community proudly displayed athttp://www.bom.gov.au/inside/services_policy/serchart.shtml . The Charter claims the Bureau will “Reply to your letters, faxes and e-mails within two weeks – on more complex issues, our initial reply will give you an estimate of the time a full response will take, and the cost, if any.” While lower level officers reply courteously well within this time (usually within hours or at most days), it seems the CEO is above this requirement. It seems the Bureau has a long way to go in its aim to “Develop a more streamlined system of handling your enquiries and feedback on our services”. I therefore request that you act to obtain for me an immediate reply to my queries from Dr Vertessy. I also expect his apology and an explanation for not meeting “acceptable standards of quality, timeliness or accuracy”. Until then, Dr Vertessy’s lack of response speaks volumes about his own credibility as a scientist, a communicator, and the Bureau head, as well as the credibility and accountability of the Bureau of Meteorology as a whole. I have just completed the 6 week online course “Making Sense of Climate Science Denial”. What joy! (that I’ve finished). This was Climate Science Lite- at its most basic. I don’t think we have to worry too much about the trolls trained up by this course. FACT: There is no evidence for any “hot spot” in the tropical upper troposphere, the hypothetical existence of which is one of the key signatures of man-made global warming. Satellites have been measuring temperatures of layers of the atmosphere since 1978. The most recent version of the UAH (University of Alabama- Huntsville) dataset shows the tropical upper troposphere has in fact a much smaller trend than climate models say it should be. The data show no amplified warming of the upper troposphere, and no hot spot. Further, since the 1950s thousands of weather balloons have been deployed in the atmosphere and have likewise failed to identify any hotspot. There is a myth, however, that claims that lack of evidence for the hot spot is not important, as the hot spot would be evidence for any natural warming, not just greenhouse warming. Those who advance this myth admit there is no sign of the tropical hot spot, but say that any sort of warming will produce one. This is true. They fail to explain, however, the reason for its absence, and fail to explain that as a consequence, global warming, natural or man-made, cannot be amplified by feedback from water vapour when there is no evidence for this in the most important location. Being a strong greenhouse gas, this additional water vapour adds to the warming due to carbon dioxide (or any natural warming) in a positive feedback. This is the reason that finding the hot spot is important. If it is not there, in the most important atmospheric layer for feedback from water vapour, then there is little evidence for amplification of global warming beyond that expected from carbon dioxide and other man-made greenhouse gases. Unfortunately, even after decades of warming, neither weather balloons nor satellites can find any evidence for this hot spot. Saying that the missing hot spot is not important is an example of the fallacy of misrepresenting the science. To claim this, misrepresents the science which says that the tropical hot spot would be strong evidence for the expected amplified warming due to increased water vapour. The lack of the tropical hot spot is indeed a major problem for climate scientists. No hot spot, no excessive warming. This response provides no reference to a place where this myth can be found. It also contradicts itself: the beginning states that the hotspot is a key signature of man-made warming, but further on it explains that a hotspot would be produced by any sort of warming, natural or otherwise. As a result I was not sure what the myth was supposed to be. I was confused when I first read this. Had to do some research myself to better understand this one, having never heard of it before. Excellent. Much better than mine. You are currently browsing the kenskingdom blog archives for June, 2015.